Size: 19 3/4 x 13 5/8 inches. From the Theatrum Orbis Terrarum. The first printed map of the Pacific and acknowledged to be a cornerstone of cartography and one of the most beautiful and decorative of the Ortelius maps. The map grossly underestimates the size of the Pacific and includes an early representation of the North American west coast and New Guinea. Wagner is quoted as saying the map "constitutes a distinct departure, being unlike any map of the Northwest coast published before 1589". 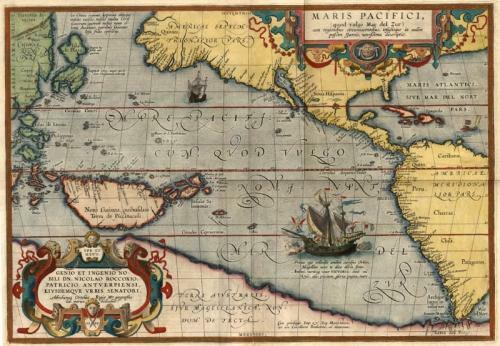 Sources for this map include Hogenberg's very rare map of the Americas, also from 1589, which has recently been shown to have been a prototype for the Ortelius Maris Pacifici. Ortelius did improve on Hogenburg by making changes in the nomenclature of the west coast and by a changed depiction of the Gulf of California. Ortelius here has removed the bulge from South America and has imposed a substantially reduced east-west extent of North America. A turtle shaped Japan is probably derived from a 1568 manuscript from Vaz Dourado. French Text on verso. The margins are clean with the following dimensions: Top Margin: 2.5 inches, Bottom Margin: 2.5 inches, Left Margin: 1 inch, Right Margin: 1 inch. In very good condition with a only small restored tear in the bottom margin. Van den Broecke # 12.